Highlighted in Ken Burns’ acclaimed documentary, The Civil War, Elisha Hunt Rhodes is perhaps the most widely known Rhode Islander of the Civil War. 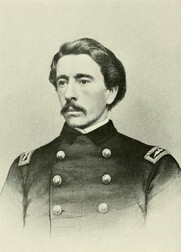 Rhodes came to Burns’ attention through the publication of his Civil War diary, “All for the Union,” in 1985 by his great-grandson, Robert Hunt Rhodes. The first entry was written in May 1861, shortly after the war began, and the diary closes with an entry dated July 28, 1865. This entry was posted in Uncategorized and tagged 2nd Regiment Rhode Island, 2nd Rhode Island Regiment, American Civil War, Civil War, Civil War Rhode Island, Elisha Hunt Rhodes, Fred Zilian, Rhode Island Civil War. Bookmark the permalink.